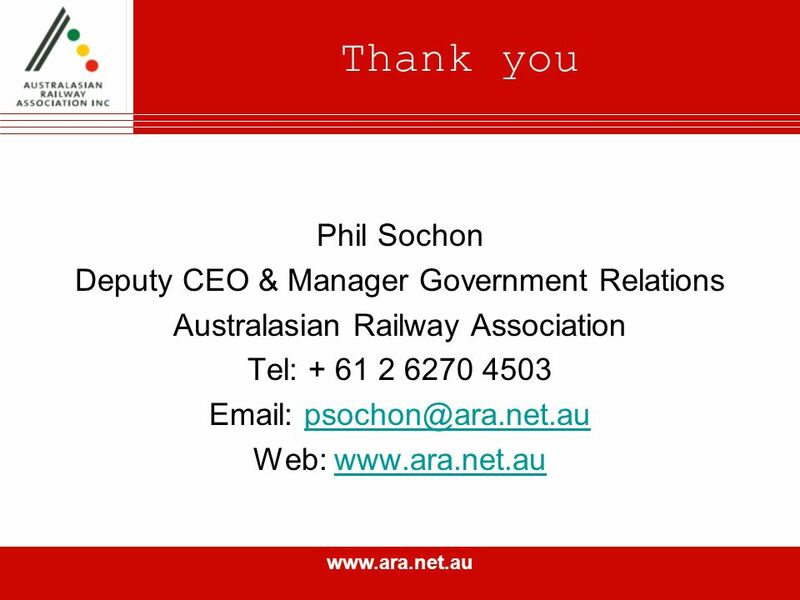 Www.ara.net.au Innovative and Cooperative Approach to Improve Safety at Rail Level Crossings in Australia Phil Sochon Deputy CEO Australasian Railway Association. 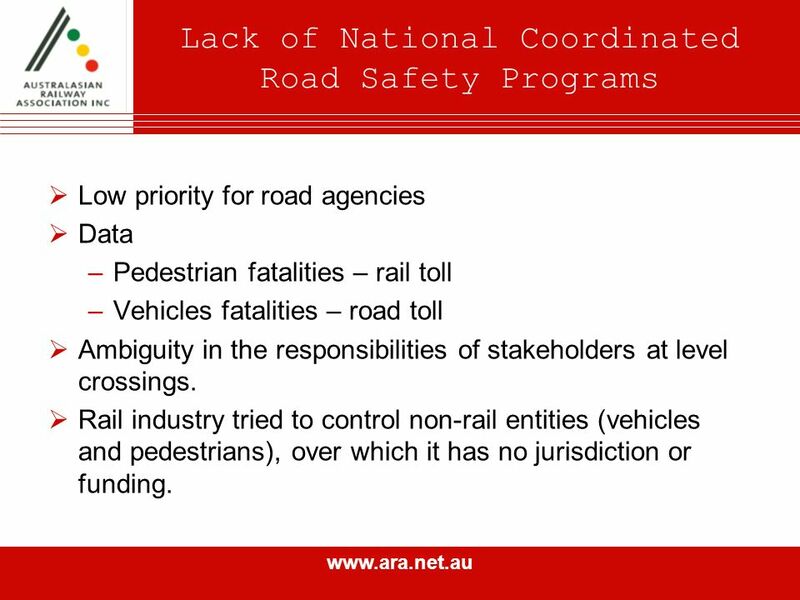 12 www.ara.net.au Lack of National Coordinated Road Safety Programs Low priority for road agencies Data –Pedestrian fatalities – rail toll –Vehicles fatalities – road toll Ambiguity in the responsibilities of stakeholders at level crossings. 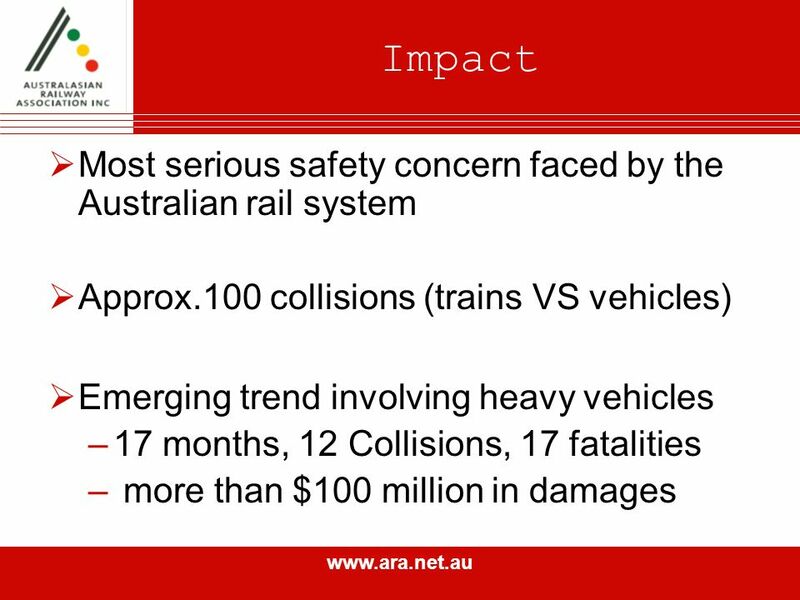 Rail industry tried to control non-rail entities (vehicles and pedestrians), over which it has no jurisdiction or funding. 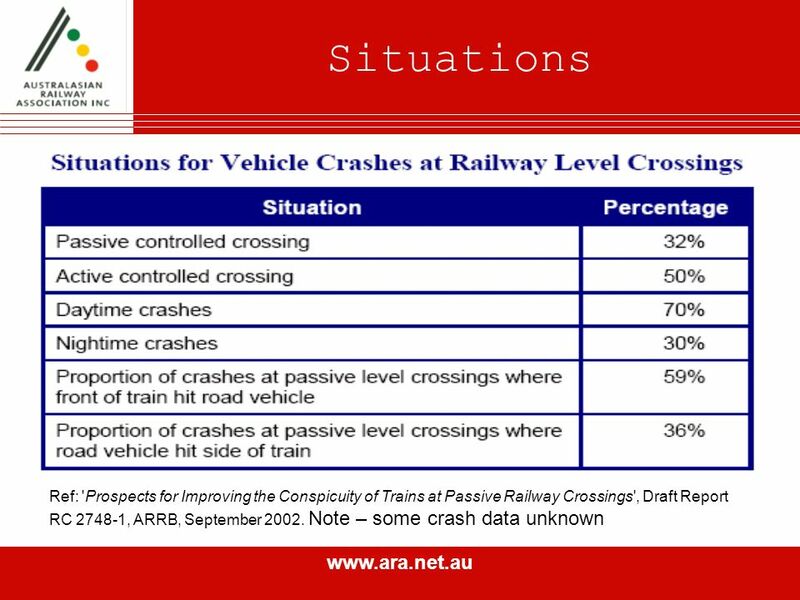 13 www.ara.net.au Australian Railway Crossing Strategy Implementation Group (ARCSIG) National Railway Level Crossing Safety Strategy formed in response to major level crossing crashes in 2003. 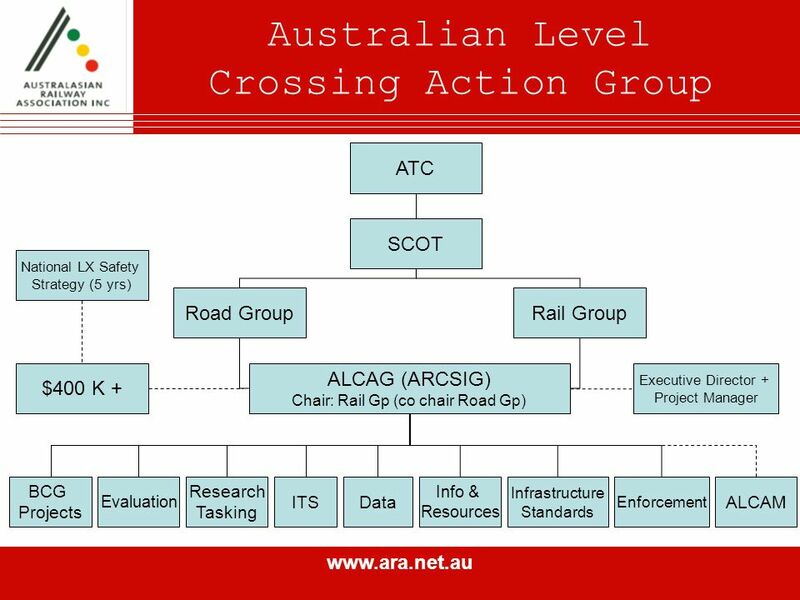 ARCSIG formed to oversee activities under the Strategy. 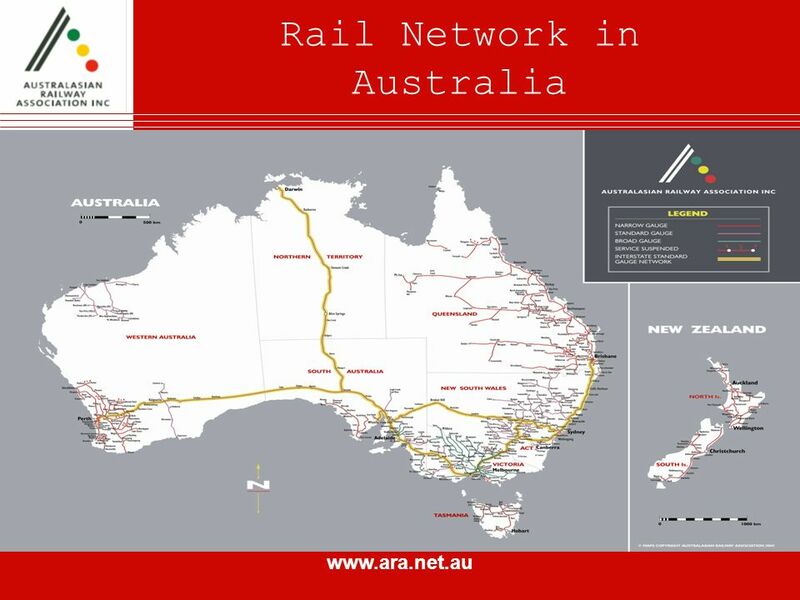 –dual-modal (road and rail) membership. 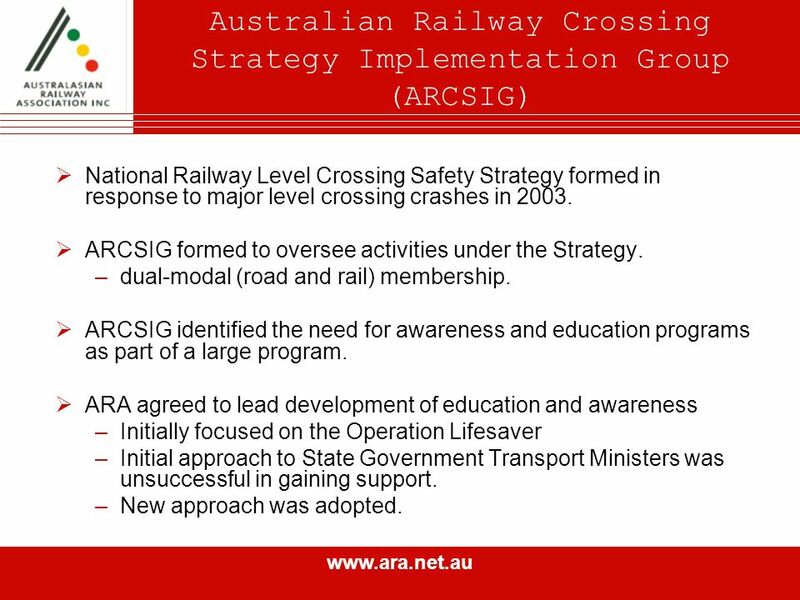 ARCSIG identified the need for awareness and education programs as part of a large program. 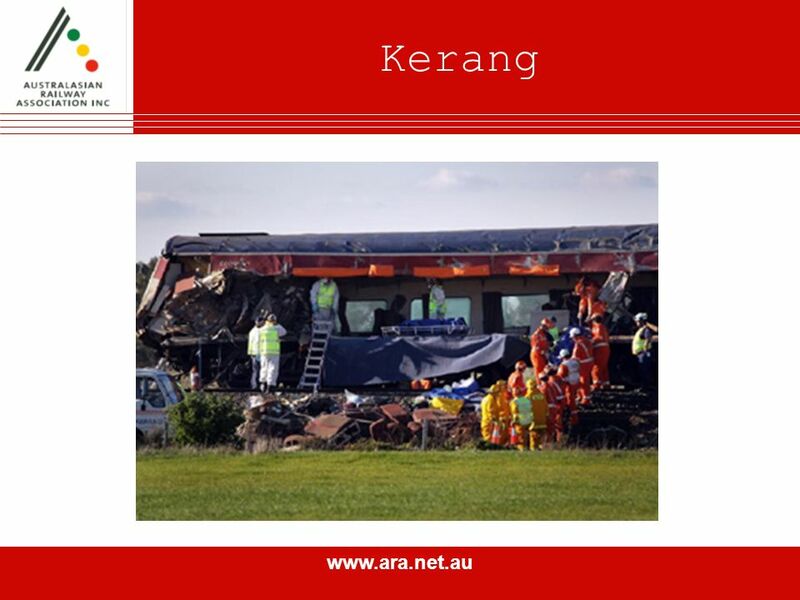 ARA agreed to lead development of education and awareness –Initially focused on the Operation Lifesaver –Initial approach to State Government Transport Ministers was unsuccessful in gaining support. 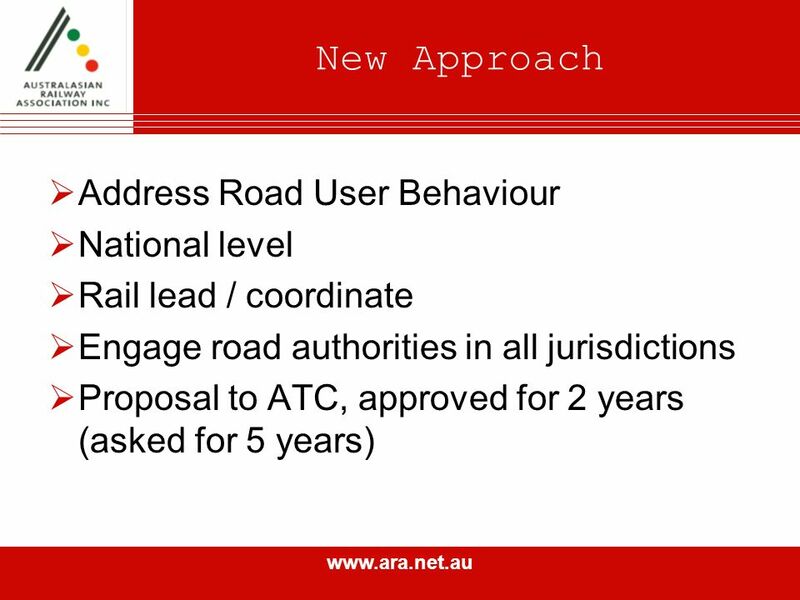 –New approach was adopted. 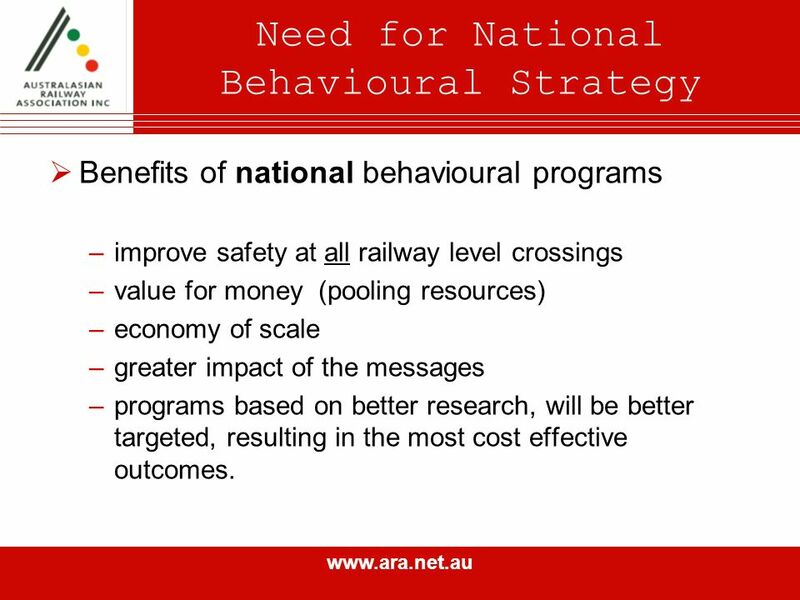 15 www.ara.net.au Need for National Behavioural Strategy Benefits of national behavioural programs –improve safety at all railway level crossings –value for money (pooling resources) –economy of scale –greater impact of the messages –programs based on better research, will be better targeted, resulting in the most cost effective outcomes. 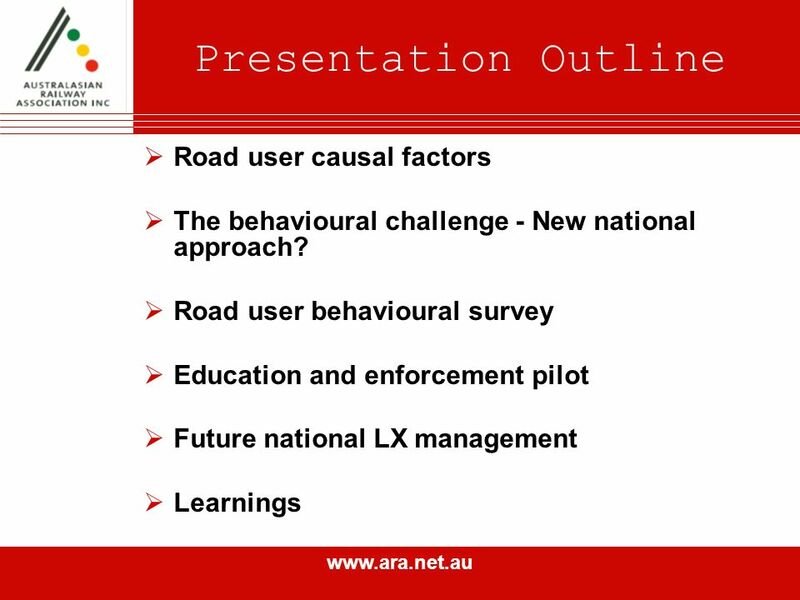 19 www.ara.net.au National Survey Quantitative Questions: What factors come to mind which may contribute to unsafe conditions or crashes at RLCs? How long is a reasonable time to wait at an RLC? 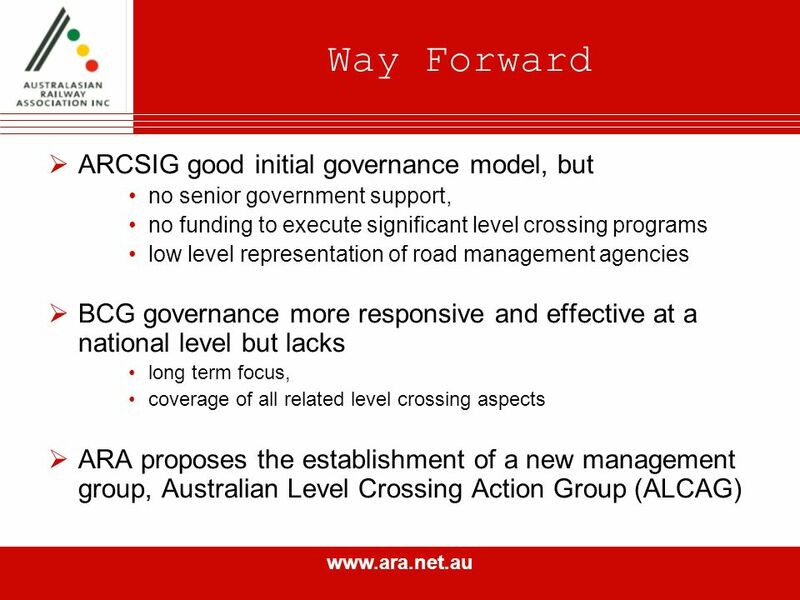 Have you ever crossed a RLC and not been aware of it until afterwards? 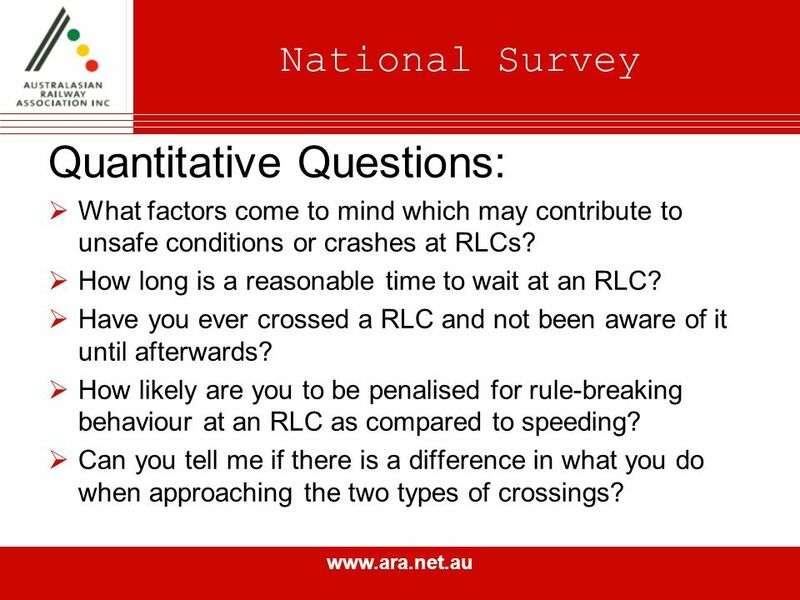 How likely are you to be penalised for rule-breaking behaviour at an RLC as compared to speeding? 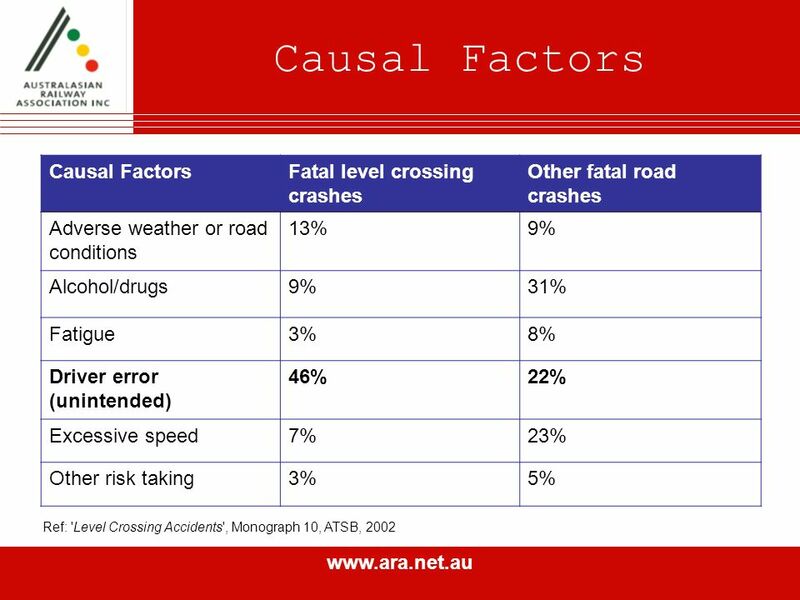 Can you tell me if there is a difference in what you do when approaching the two types of crossings? 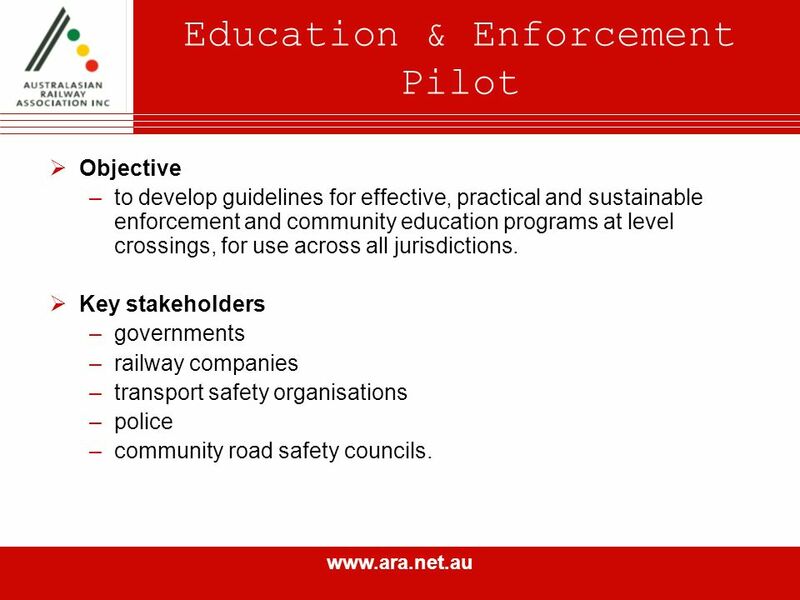 20 www.ara.net.au Education & Enforcement Pilot Objective –to develop guidelines for effective, practical and sustainable enforcement and community education programs at level crossings, for use across all jurisdictions. 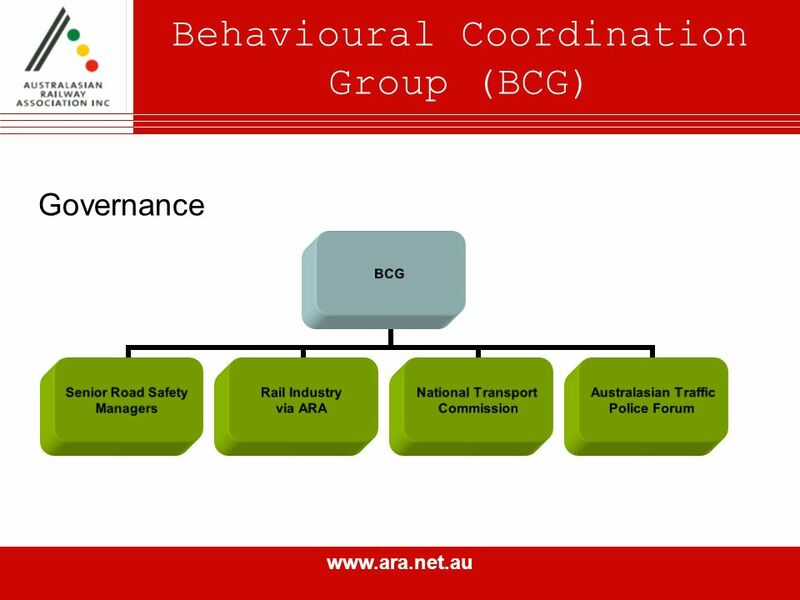 Key stakeholders –governments –railway companies –transport safety organisations –police –community road safety councils. 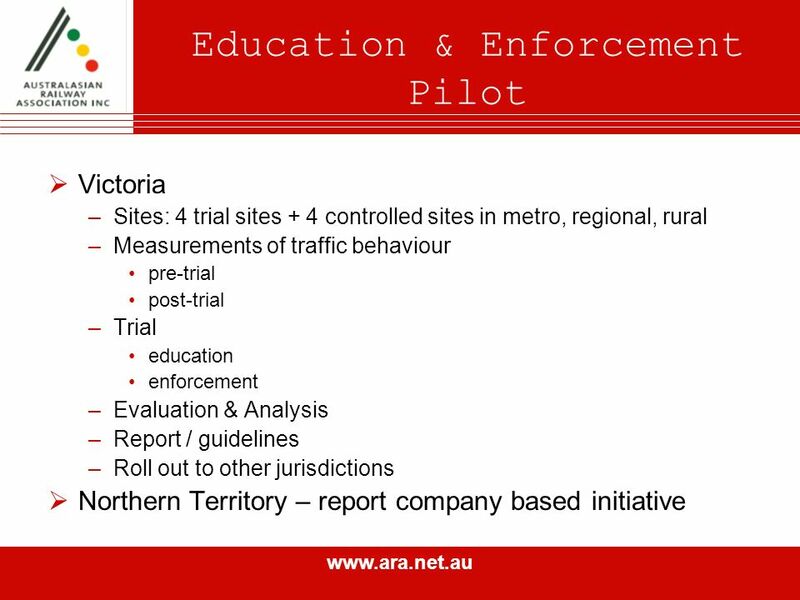 24 www.ara.net.au Learning: Strategic Alliances and Partnership Vital Partnership approach between Industry, Government, road, rail & the police –Note: Canadas Direction 2006 model. Benefits: –Stakeholders managing those aspects best suited to their competencies –Expertise of each stakeholder can be drawn upon as necessary, allowing the development and delivery of better programs. 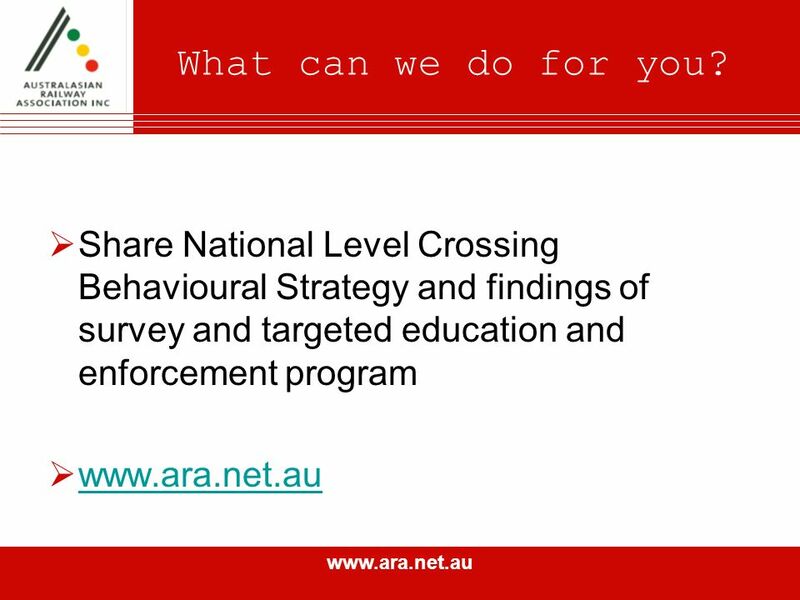 26 www.ara.net.au Share National Level Crossing Behavioural Strategy and findings of survey and targeted education and enforcement program www.ara.net.au What can we do for you? 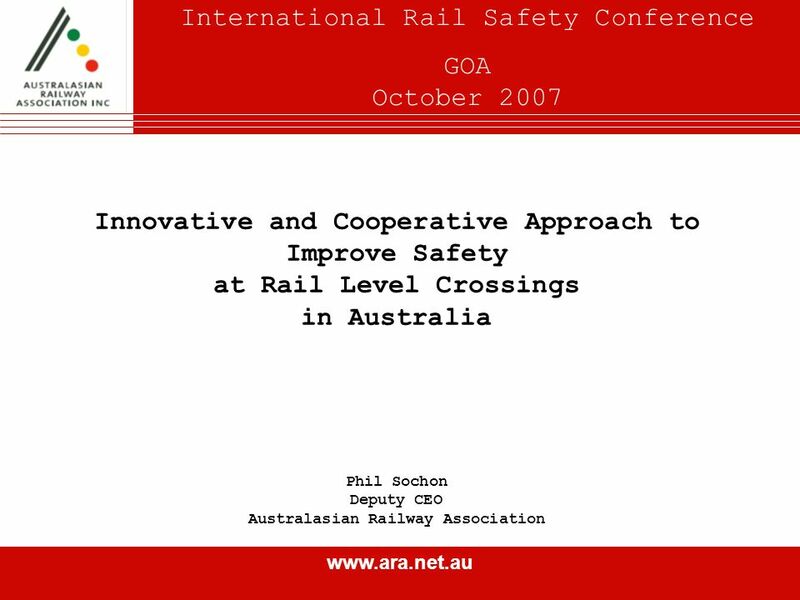 Download ppt "Www.ara.net.au Innovative and Cooperative Approach to Improve Safety at Rail Level Crossings in Australia Phil Sochon Deputy CEO Australasian Railway Association." Jörg Beckmann, ETSC Executive Director ETSC and the SEC Belt Project Best in Europe 2004. Status of National Effort to Enhance Road Safety in Ethiopia Presented by National Road Safety Coordinating Office 9 th Meeting of the UNRSC, November. 1 European Motorcyclists' Forum Brussels, 28 June 2010 Powered two-wheelers safety policy in France Joël Valmain Adviser for European and International. 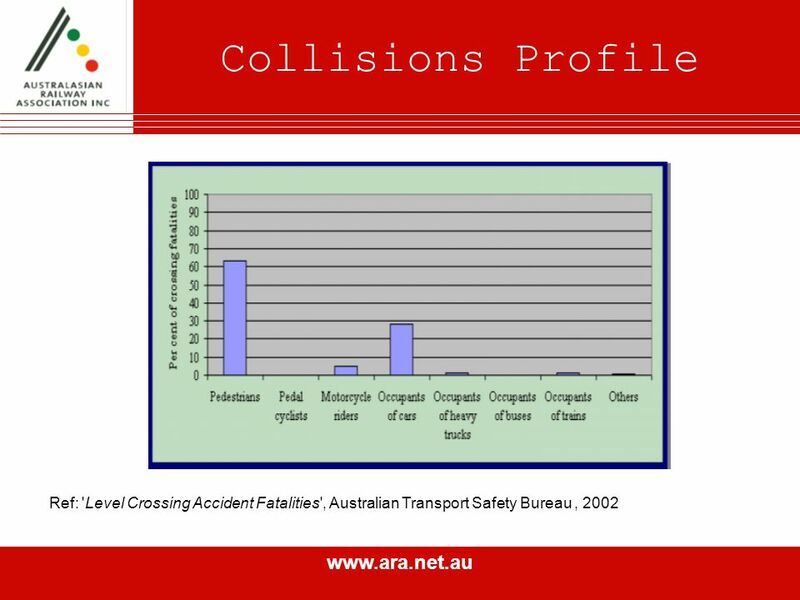 Institutional and Cultural Barriers in Road Safety Peter Daly Chief Engineer Traffic and Roads. 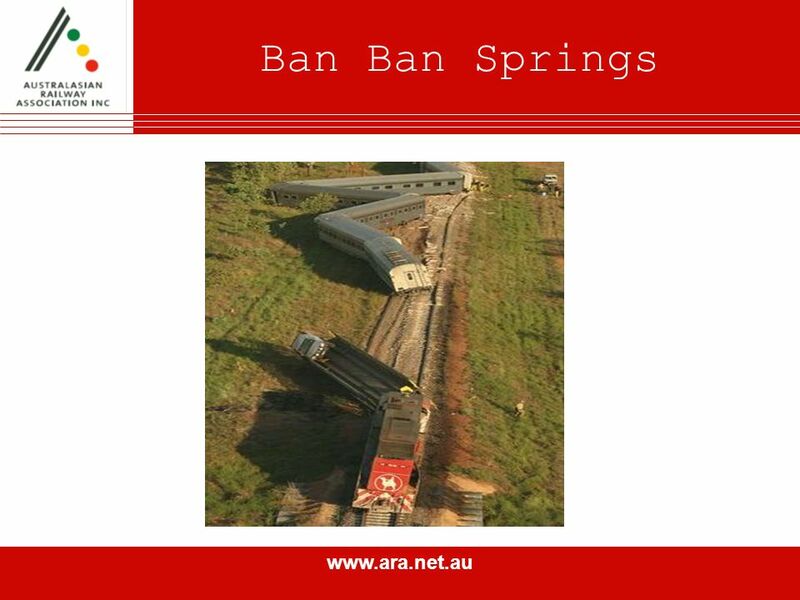 Collaborative Planning as an Effective Tool for Program Management and Sustainability … beyond UASI funding … Sandra Davis Sandra Davis Denise Barrett. 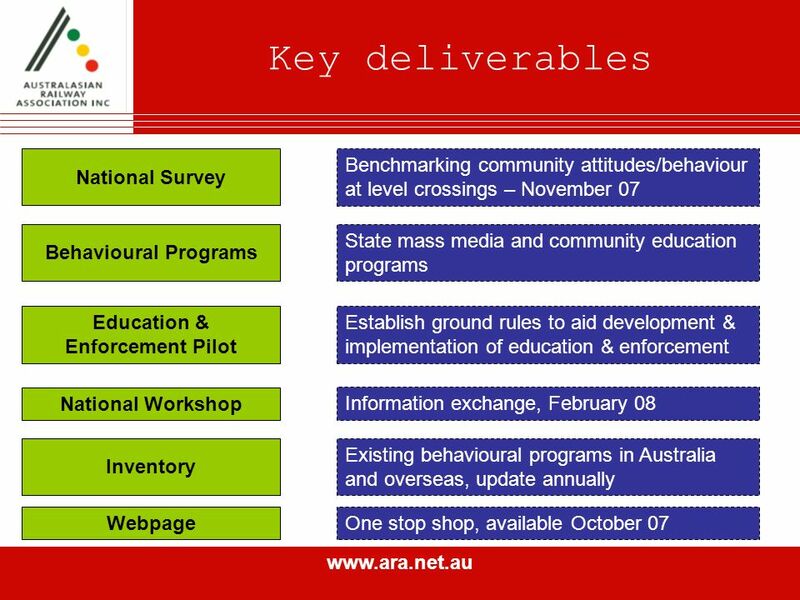 SERVICE INTEGRATION IN A REGIONAL HOMELESSNESS SERVICE SYSTEM Joint research project between Northern Rivers Social Development Council and Regional Futures. 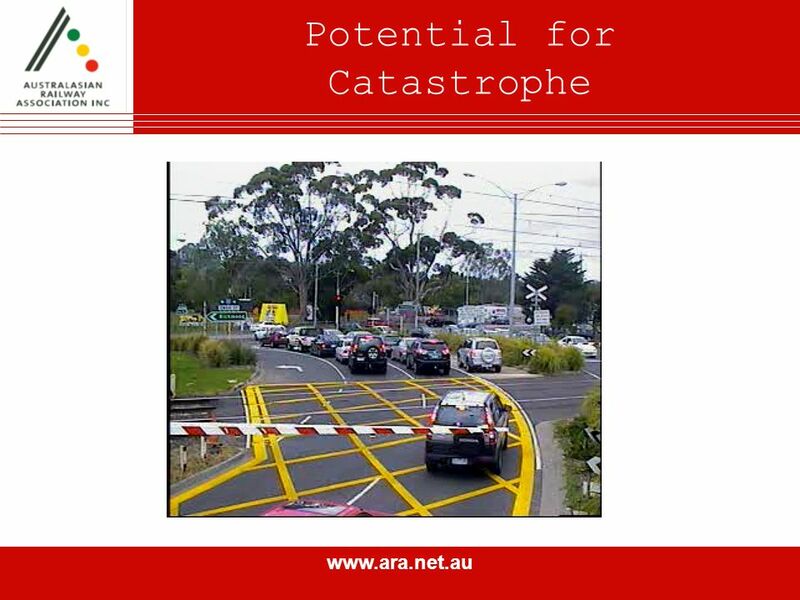 FACULTY OF ENGINEERING & INFORMATION TECHNOLOGIES Interference-Aware Message Forwarding for Vehicular Networks Centre for Distributed and High Performance. NATIONAL SKILLS ACADEMY FOR CONSTRUCTION Jamie White National Skills Academy for Construction. 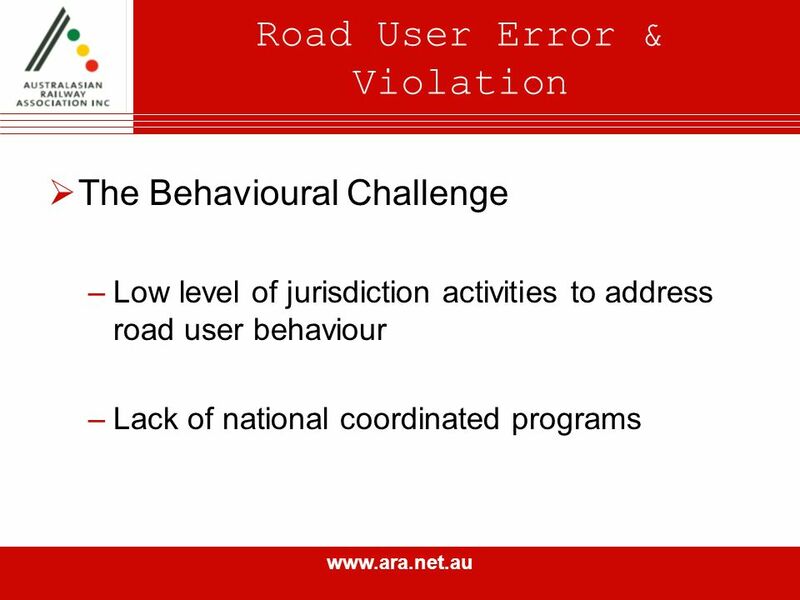 Cross-jurisdictional Policing Perspectives Jon White, ANZPAA CEO 13 November 2012. 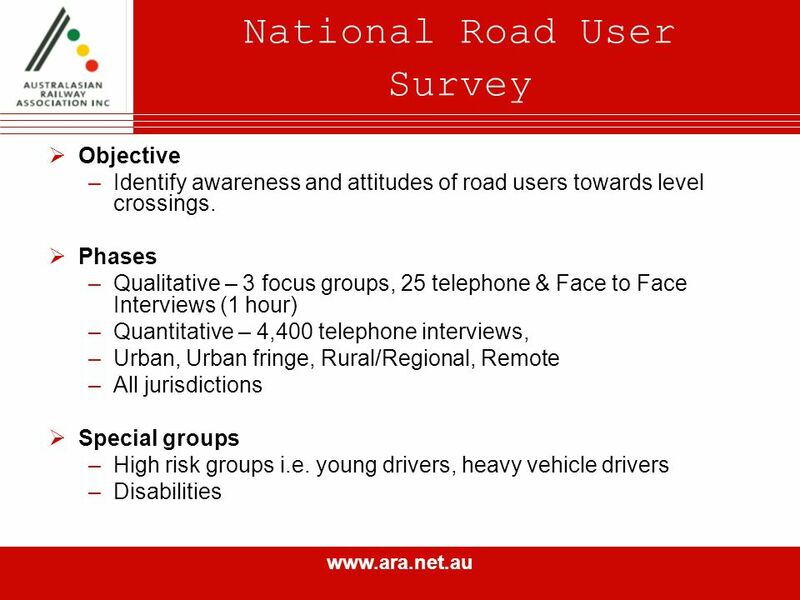 Urban Speed Limits- the need for uniform action in the N.T. 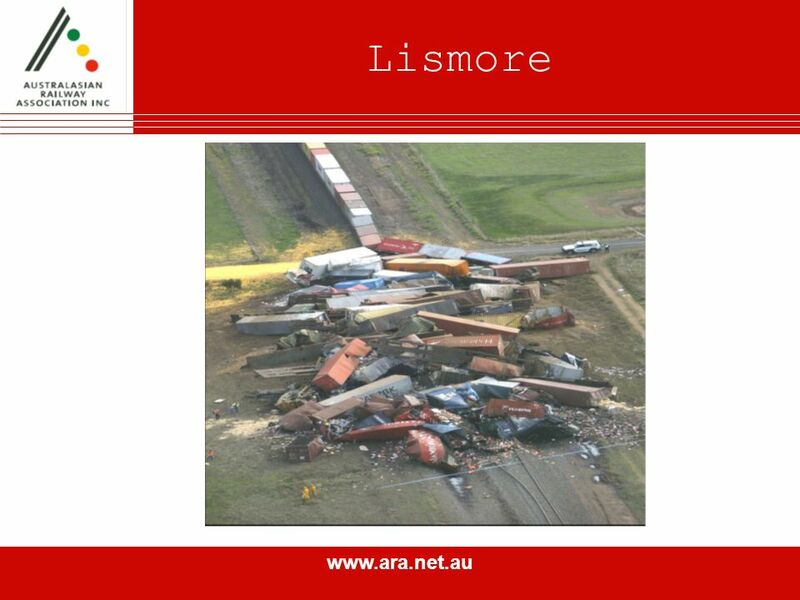 Presentation to PHAA(NT) 2008 AGM.